Just one week from today, our son Britain and his dog Lucy will be 500+ miles from home, on their way to San Francisco and a new life on the West Coast. Lucy’s presence has added much pleasure to my exercise routine for over a year now. This morning reality hit me square between the eyes. We have only six more walks. Then she’ll be gone, never to return. I know, NEVER is a long time (even longer in dog years). Of course, she could be back, but chances are she won’t. It’s a 2,700 mile trip from West Virginia to California, not something one does on a whim, and certainly not something one wants to do regularly with a dog. Initially this morning‘s walk was like all the others. I was tossing a ball, listening to my iPod, and watching for cars. In the background, a thought kept nagging at me: Six more walks. Six more walks. Six more walks. I felt a sense of urgency and a need to make the most of the time we had left. So I turned off my iPod and gave 100% of my attention to Lucy. I wanted to really be in the moment, to soak it in, to record it deep in my memory banks. “Bark! Run! Chase!” It seemed simple enough. But, of course, there was more. Lucy loves to chase Frisbees, squirrels, sticks, cats, deer, and every kind of ball. She also loves to retrieve, so she prefers balls and Frisbees. But she won’t carry a ball for a two-mile walk, so, as usual, I threw it a couple of times and then stowed it in the newspaper box and kept on moving. As I walked ahead, she whined and barked for a bit, but then she caught up with me. She’s such a good companion, always willing to walk by my side, no matter the weather, the place, nor the time of day. A couple of blocks into the walk, she spotted it. From her body language, it seemed like it must be the best thing she’d ever seen in her whole life. And there it was, just lying in the gutter! Wagging her tail, she picked up the broken, orange Wiffle ball and charged out ahead of me, thrilled with her newly discovered treasure. It doesn’t matter when one pleasure is left behind, the Universe has an unending supply. And each experience will provide its own brand of joy. Don’t focus on the past and what used to be. Keep your eyes open for the next treasure. And when you find it, pick it up and RUN! Dannie, Lucy, and I hiked Carriage Trail after the church hot dog sale. It’s a public trail, but the threat of rain seemed to discourage a crowd. As usual, we took a break for a little stick chasing, and I also stopped to take some photos with my cell phone. When we returned to the church, I ordered a couple of hot dogs to take home to Britain. Reaching into my back pocket to grab some cash, I came up empty. Bewilderment – panic – analysis. It must have come out of my pocket when I pulled out my phone to take pictures. Quickly I turned to Lucy, “Let’s go find my money!” She was a ball of eagerness, even after the hour-long hike. With that comment, she stopped and looked up at me. Her energy seemed to drain, and she looked confused. “Why bother then?” her eyes asked. Off she went, sniffing and looking. I was right behind her. If you want to kill enthusiasm and energy, start your quest with “can’t” or “won’t” or “it’s impossible.” Even a dog knows that if you want to find something, you have to start with the belief that it’s there. So, no matter what you’re looking for (a job, a mate, or even lost money), perk up your ears, open your eyes, and hunt with determination. And it’s a nice touch if you wag your tail once in a while, too. Oh, yes, we DID find the money … scattered all over the trail just waiting to be easily found by someone who was paying attention. Bye, bye, my Sweet Lucy. I will miss you more than words can say. When I landed at the San Francisco airport last Wednesday, I glanced out my window only to see the burned out shell of the airplane that had crashed just days before. The ground was still littered with plane parts and personal items from inside the cabin. It took my breath away to see it all spread out in front of me, starkly real. I said a prayer for the people who were on that plane, and felt gratitude that my plane had landed without incident. I was walking a little slower than usual through the airport, still reflecting on bigger thoughts and feelings than, “where do I pick up my luggage.” I was just about to exit the moving sidewalk when I glanced down and saw it … something I had never seen in my entire life. It was a huge wad of 100 dollar bills that I could barely wrap my hand around. In a fast, fluid motion, I picked it up and put it in my pocket. Then, off the moving sidewalk, I stopped and looked around. The corridor was empty. Completely empty. I was totally alone in that part of the airport. There was no indication of who had dropped the money, and no one had seen me pick it up. I stood there for a moment with many thoughts running through my mind. Mostly I was trying to decide what to do next. Eventually people passed me and then I began walking again toward the baggage claim area. I looked around for someone who looked “official,” maybe a security officer or someone from TSA. Just about then an official looking person zoomed past me on a Segway … off to an emergency it seemed. I wondered if the emergency had anything to do with the contents of my pocket. I kept walking. I was scanning the crowd looking for “something.” The closer I got to baggage claim, the more I wanted to count the money and claim it as my own. A part of me started thinking about what I would buy with the money while another part thought about filling out the paperwork associated with turning the money into authorities. And that is the end of my story. I continued to the baggage claim, a little late, with a feeling that I had been used by the Universe, ever so briefly, to take care of someone. It’s not the first time I’ve been in the right place at the right time to help someone in need. I hope it’s not the last. It’s sort of nice to know how angels must feel on a daily basis. You might think I pulled that quote from a coach training manual. Actually, it would be the perfect thing to say to clients as they envision the possibilities of purposeful change. I’ve probably said a variation on it dozens of times. But that’s not where I found the quote. I read it just this morning in a book entitled, Journeys to Abstraction … 100 contemporary paintings and their secrets revealed. It just goes to prove once again that my art-life is a reflection of my life-life. I find new insights every time I pick up a paint brush, or, like Tuesday, when I skipped the brush completely and just used my fingers (see the results above.) Sometimes in life, you just have to get your hands dirty to get the results you’re looking for! But last night, on a different painting, I wasn’t getting the results I wanted. Half of it was pretty good, but the other half was frustrating me. I began smearing paint all over the place, but I just made a big mess. It sort of reminds me of those times when part of my life was working and part wasn’t. In desperation, I just wanted to do something different to make things better, but that’s not usually what happened. Most times I just ended up with a big mess! This used to be my Life Motto. What I’ve learned to appreciate about myself, though, is that I don’t give up easily. 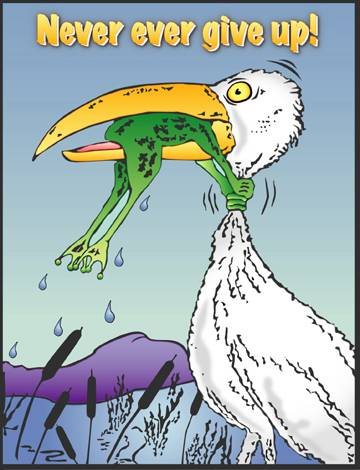 I used to have this bird/frog picture on a t-shirt. I claimed it as my life motto. My pattern is to take a stab at solving things and then follow up with some research. That’s why I was reading about abstract art this morning. As it turned out, that following year WAS the best year of my life (up until then). It was the year I finally stopped being so afraid. It was the year I woke up and started making purposeful changes in my life. It was the year I became a coach. So, with some helpful tips from this latest art book, I think I’ll apply life-life lessons learned to my art-life and start experimenting with a few PURPOSEFUL changes.